Butterfish, left, and salmon were grilled with sake kasu. Kasuzuke is the lesser-known cousin of misozuke, as in Misozuke Butterfish, that well-loved, slightly sweet pairing of fish and miso. Kasuzuke incorporates sake kasu -- or sake lees, a byproduct of the sake-making process. It's a light, pasty substance that resembles miso, and if it doesn't sound all that attractive, remember that miso is really fermented soy bean paste. Mary T. Miyashiro has been searching Japanese cookbooks for a Kasuzuke Butterfish recipe and asked for help. It seems that sake kasu dishes are common home-style cooking in Japan, but recipes are nowhere near as easy to find as those for miso, at least not in English-language cookbooks. So, rather than expend more time with the printed word, I took the easy way out and asked a chef, Hiroshi Fukui of L'Uraku. It was easy for me, anyway. Turns out Fukui doesn't use sake kasu at his restaurant, but agreed to experiment with a batch. It was a further-pursuit-of-knowledge kind of thing. He says kasu is frequently used in Japan with fish, especially salmon, as well as in soups and to make pickles. It is more subtle than miso and so requires more sugar and salt to bring out the flavor. That flavor is vaguely boozy, by the way -- remember, the root ingredient here is sake, which is way more potent in terms of alcohol than wine. Do not serve to someone who is sensitive or allergic to alcohol. Find sake kasu at Japanese markets, refrigerated near the miso. It's pretty cheap. You can buy it in bulk at Marukai for $5 and less for 5 pounds, but Fukui prefers a type that's pressed into sheets and sells for about $3 a pound at Daiei. 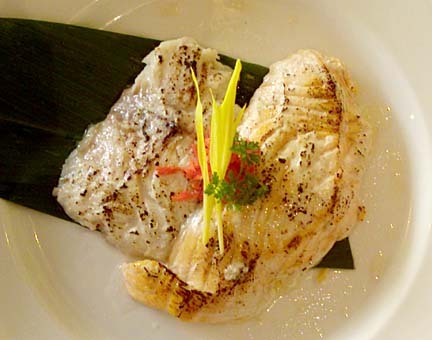 This recipe can be made with the salmon in place of the gindara, or butterfish. Combine marinade ingredients well. Marinate fish, refrigerate at least 18 hours. Broil fillets 8 to 10 minutes. Combine mochiko, pumpkin and sugar. Add coconut milk gradually, while stirring. Dough should be soft enough to form wet balls; add more coconut milk if necessary. Drop by tablespoons into hot oil. Fry until golden.